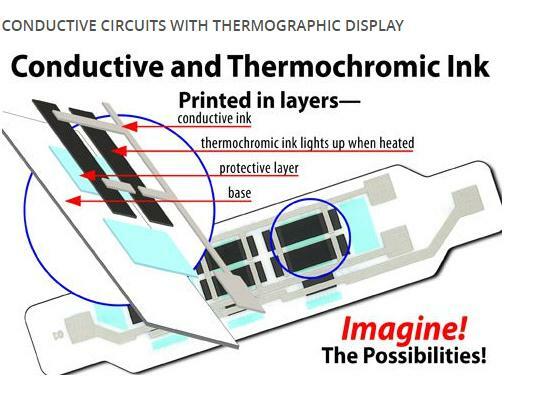 The electrical circuit and the colour changing thermochromic display that measures battery capacity is printed on a thin flexible plastic strip using thermochromic and conductive ink. Battery capacity is visualized on a thermochromic scale that changes colour from the heat generated when the circuit is charged electrically, causing a calibrated colour change providing information as to battery performance. This capability can be customised to create various battery powered colour changing designs, displays and messages. Numerous colours are available.